I can’t stand sitting around with my hands idle and nothing to do. I get antsy and fidgety and literally have to entertain myself with some sort of project I can tote around in my purse. I guess that’s why I like knitting and crocheting so much. 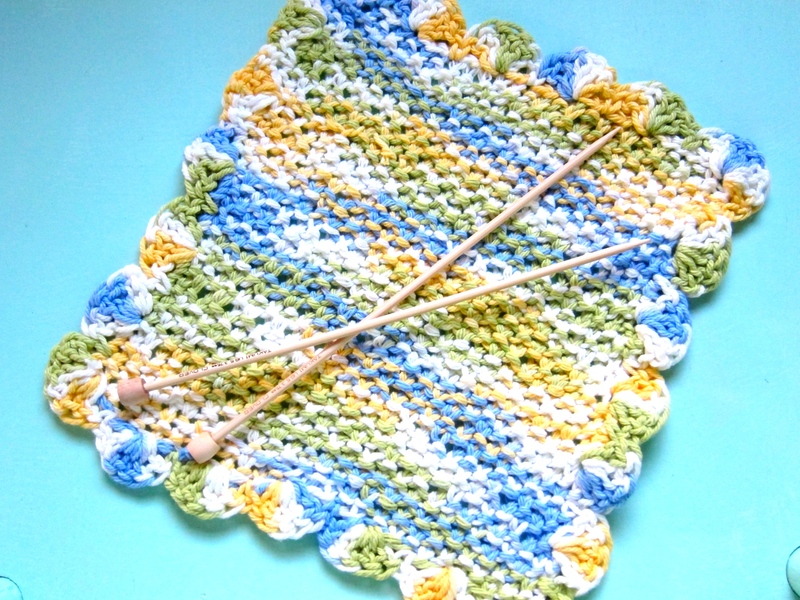 It’s so easy to grab a ball of yarn, a crochet hook or a pair of knitting needles and just toss them in my bag. Whether I’m watching tv or on a long road trip with my family, you’ll almost always find me working on a project that involves a pretty ball of yarn 🙂 I’ll either be working on a scarf or a blanket. So far those are the only things I know how to make. But then again there is only so many you can make before you want to try something new. Know what I mean? I’ve been wanting to add to my repertoire but feel a tinge of intimidation when it comes to knitting socks, hats or sweaters. I know eventually I will get there but for now I feel a bit helpless. I’ve seen people knitting socks using three or four double pointed knitting needle and honestly it’s over my head. Yes I’m intimidated. I’m just not there yet but I’m hopeful…lol! I do like quick weekend projects and had to think of what I could make that would be useful. I thought these cute dish cloths would be perfectly fun and easy to make. This first one I actually made many months ago. Unfortunately I must have tossed the yarn wrapper that had the yarn color on it. I had gone back to Michaels several times and even checked Joanns but it looks like it’s been discontinued. I can’t remember how many chains I crocheted but I chained as many as needed for the size I wanted. It’s pretty easy to just eyeball it. Then I just double crocheted across and repeated the rows until I was happy with the size. As you can tell this one is not very big and measures about 7 x 7 without the scalloped edge. After I added the scalloped edges it measured 8 x 8. 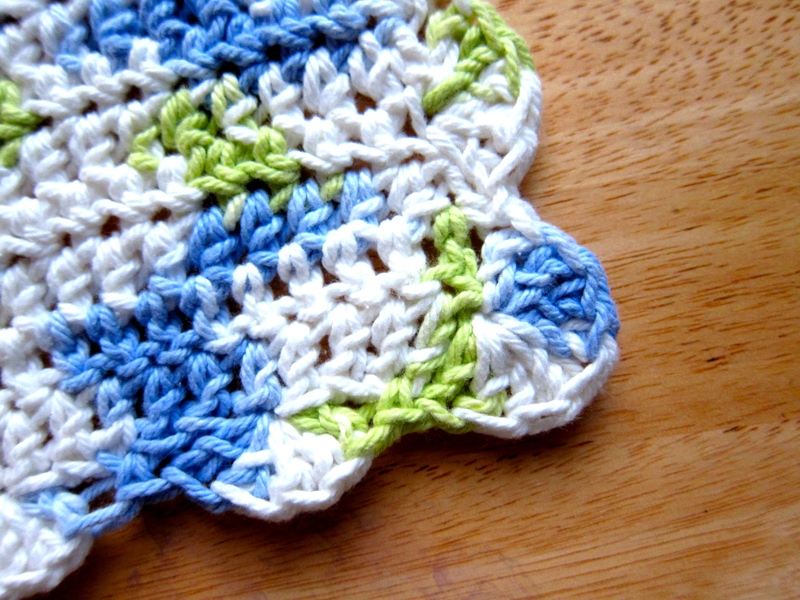 I found a very easy tutorial on how to crochet scallops right here. It’s easy peasy! This next dish cloth I knitted using the seed stitch (knit and purl). Again I chained the length I wanted the cloth to be and then knitted several rows until I reached the desired length. This cloth measured 8 x 8 without the scalloped edges and 9 x 9 with the edges. Easy and fun. You can add an edging if you like or just leave it plain. If you don’t like scallops you can research Youtube or Pinterest for more ideas. 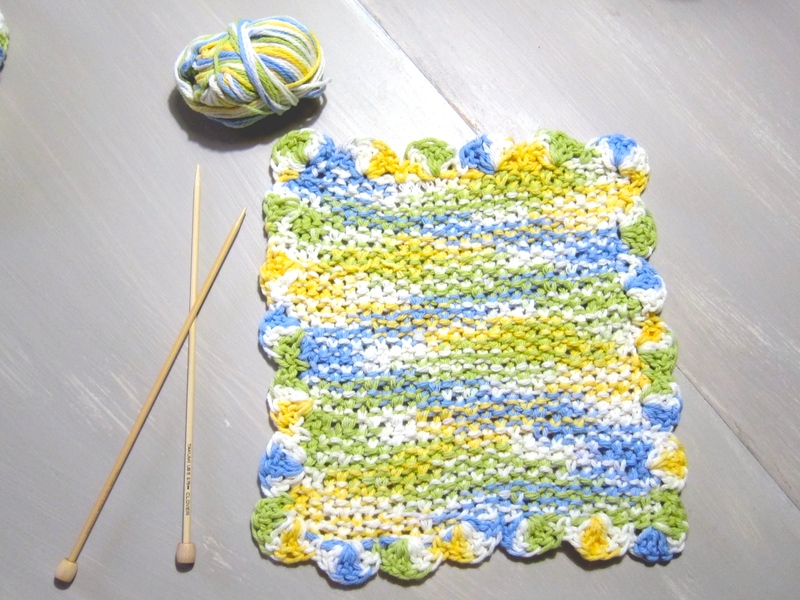 The colors are almost similar to the yarn I used for the first dish cloth except this one has a touch of yellow. It is called Cool Breeze Ombre by Lily Sugar n’ Cream. 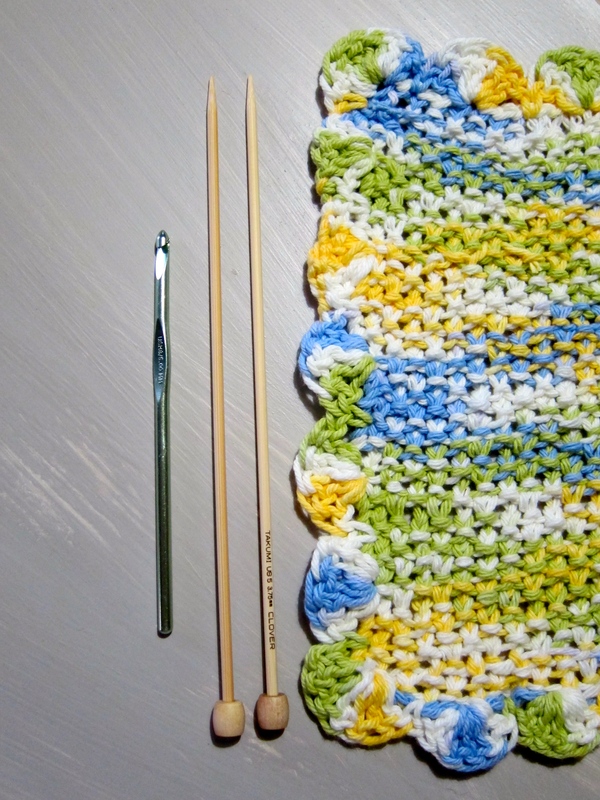 So in closing, if you are new to knitting or crocheting and are looking for a fun, quick beginner, weekend-type project, I’d recommend making dish cloths. 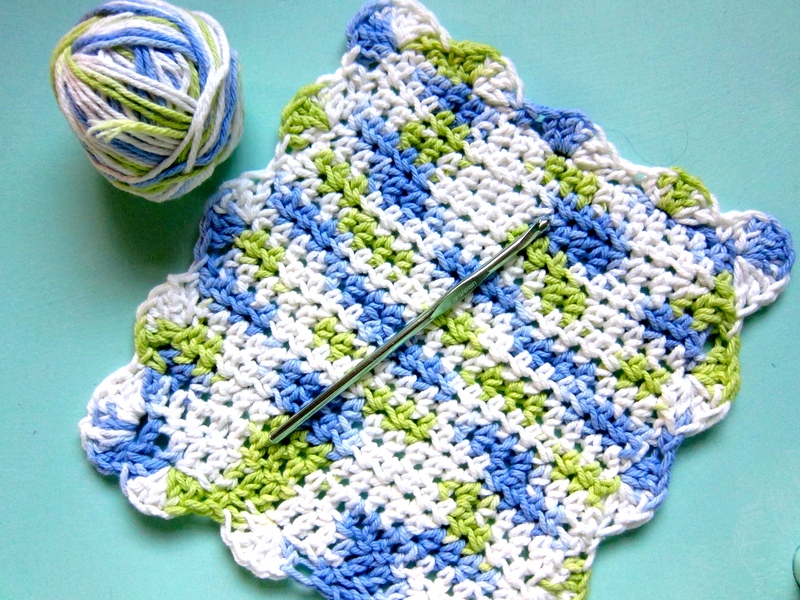 It’s easy and you can make several of them in different color combinations and even try out new patterns. They even make for a great housewarming gift. Just fold nicely and tie a bow using twine, arrange nicely in a gift basket and throw in some nicely scented soap and wala!!! Have a fantabulous night everyone!